Working with Horn of Development Initiative (HODI), we’re helping deliver new knowledge to women in Kenya’s far north. Called Her Voice, our solar and wind-up Lifeplayer MP3s provides content that pastoral women want and need. Up to 90% of women are illiterate and have very few options for learning. Women must carve out livelihoods against a backdrop of climate change with their livestock dying in record numbers. They walk longer and longer distances to fetch water and firewood leaving them less time for anything else. Women now have the added responsibilities for the survival of their families as men, who were former livestock keepers, migrate to towns and cities. 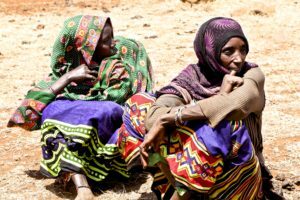 Proud and hardworking Borana, Gabra, Rendile, Samburu, Turkana and Burji women’s listener groups in Marsabit County will access educational and practical health, livestock, child care and livelihood content in ways never before possible. Sparsely populated, Marsabit County is twice the size of Belgium, is home to more livestock than people, and is only 2% grid electrified. Bordering Ethiopia, its population is less than 300,000 and the majority are pastoralists. This makes service delivery for health, water, sanitation and education very difficult. Marsabit County is heavily dependent on external relief. This is due to a combination of factors – harsh living conditions, a year-on-year drought, and a lack of investment in education and health from the central government. It’s also physically and politically isolated from the capital, Nairobi. Recently a paved highway completed has shortened the journey from more than two days to less than 10 hours, opening up more economic opportunities. HODI is helping to change the status quo in Marsabit County. It’s building resilient communities through Mala-Marii, a tested community dialogue process that puts women in the lead. Historically, women have had little participation in development and decision-making. Socio-economic, cultural and religious biases, whether Muslim or Christian, have placed females on the margins. They have been subjected to harmful cultural practices like female genital mutilation (FGM), early forced marriage, and a profound lack of access to education, health care and other services. Literacy levels for women are extremely low; they simply have not had any opportunity to gain an education. Cell phone and radio ownership is also low, while internet penetration is negligible. Nomadic communities are usually made up of between 60 and 75 families. There may be one or two working radio sets and seldom more than three shared cell phones. Almost always, these are the property of men. In many parts of the county cell phone coverage is non-existent or sporadic. The Her Voice initiative addresses severe gaps in basic education and practical information access for the women (and female youth) through appropriate technologies and community participation. Building on the power of community is the hands down the single most effective strategy to meet these multiple challenges. Her Voice leverages the traditional community structures that are already in place – women’s self-help groups and women’s savings clubs. To reach these women, appropriate technology must play a key role. Despite inroads made by cell phones, large parts of Marsabit County don’t even have a cell phone signal. The long-trusted medium of radio remains the most important technology. Radio transcends geography, literacy, reaches groups in their own language without concern for airtime or data charges. Yet radio, too, has challenges. Electricity supplies are non-existent, and batteries are unaffordable to the poorest, don’t last long, and are unavailable outside towns or trading posts. Also, radio listenership is very low amongst women as men own radios and control listening access. Consequently, for this initiative to succeed, our power-independent MP3-enabled radios need to be placed in the hands of women, who will be trained to use and care for them properly, along with building dynamic listening groups. We believe in HODI’s deep approach to sustainable development in building resilient communities. We’ve seen it work. Coupled with Lifeline’s technology, Her Voice will be help fill a much-wanted need void for education, information and knowledge, In turn, it will help reduce extreme poverty.